SuperPoker is proud to introduce an all new Gold Reward Program that others simply can’t stack up to. Starting December 9th, we’ll reward you just for playing. Simply by earning Gold Chips through frequent play at any of our real money ring game and tournament tables, you’ll be building Gold Stacks.Each Gold Stack you complete earns you instant rewards. 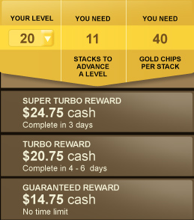 Build stacks of Gold Chips for instant rewards via our new Gold Stacks Reward Program. Beat the clock to maximize your Gold Stacks Rewards with a three-tiered reward payout schedule. Advance through Gold Stacks levels to take advantage of an increasingly rewarding payout schedule. 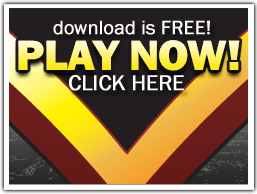 The SuperPoker Gold Stacks Reward program is incredibly simple. By earning Gold Chips through real money play, you’re building a Gold Stack. Every time you complete a Gold Stack, you’ll earn instant rewards. There’s no redeeming required by you and no points-for-cash swap. And with over 50 levels of Gold Stacks rewards to achieve and a three-tier of rewards within each level, how many rewards you reap is really your call. We reward you every time you complete a Gold Stack no matter how long it takes you. The Guaranteed Reward is of course, a guarantee, and the minimum you’ll earn for that Stack. The faster you fill each stack, the more rewards you’ll reap. Visit ‘My Account’ when logged in to SuperPoker for timing details on earning Turbo and Super Turbo rewards. There are 50 Gold Stack Reward Levels. In order to advance through some levels, you’ll be required to complete multiple Stacks. However, you’re earning rewards for each individual Stack you complete. Higher levels offer more rewards per Stack. Once you make it to a Gold Stack level, it’s difficult to fall back. The only way you will go backwards is if you fail to earn at least three Gold Chips over the course of two back-to-back months. In that case, you will be returned to level 10. You will never lose a level if you are under level 11. * Only Gold Chips earned through real money play are valid towards building Gold Stacks. * Gold Stacks Rewards are instant and require no action by the player. * Players must earn a minimum of three Gold Chips within a two consecutive months to maintain their current Level. Players who fail to meet this requirement fall back to Level 10.